Choosing a new dog bed can be a lot like choosing your own bed. You think about your dog's comfort and how they normally choose to sleep when fully relaxed. You might own a dog who likes to sprawl out, lying upside down or they might prefer to snuggle up in a tight little ball. You also have to take into account your dog's age and whether they'll grow out of it quickly, or if they are a puppy factor in any teething problems (literally). That's before you begin to think about colour and finding a bed that ties in with your home decor. But, ultimately we do it in search of a bed (or two) we hope our dog will love. After all, we make decisions on their behalf every day with the aim of creating a happy life for them. This month we were given the chance to review a luxury bed for dogs from Doggie Moggie Doodah. 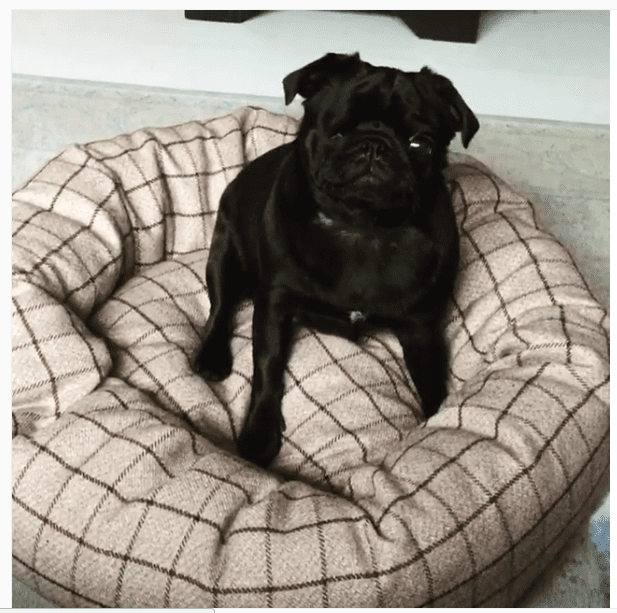 Knowing Ming Ming, a black Pug who has become as dear to us as our very own dogs had just joined our panel of celebrity reviewers (she's owned by actors Sarah Jayne Dunn and Jonathan Smith), we asked her to put it to the test. Last month Ming Ming was lucky enough to be the proud recipient of a brand new bed, courtesy of Doggie Moggie Doodah. Choosing the bed took some time and was a tough decision. With a large array of beautiful beds handmade in the UK to choose from in all different styles and patterns, we finally decided on a Donut style in a York, Mulberry design (priced from £61) without the need for a fabric swatch (which is optional) being sent. Excited for Ming Ming, I realised I was disappointed that these are not available in human size - they looked so comfortable. Ming Ming was suitably excited when her Luxury Donut bed arrived, wiggling around the parcel in anticipation - like any girl, she loves a delivery. Once the bed was unveiled the excitement only escalated, she was in the bed in a shot, sniffing, scratching and rolling around her new favourite place to be. The bed is beautiful quality. You can really see and feel the attention to detail from the high quality of the fabric. The bed can be machine washed which is fantastic for when it gets a bit grubby and the inner mattress can be removed if you don't need to wash the whole bed. This also provides a hiding place for all Ming Ming's toys which she likes to bury away for safe keeping. You can also purchase breathable waterproof liners if needed. Available in sizes from extra small to large, we opted for the small and found the size to be perfect for Ming Ming. Being a donut style, the outer edge provides a perfect place for your dog to rest their head, which Ming Ming loved. The design fits into our cottage style front room perfectly looking like a nicely chosen piece of furniture instead of a dog bed. Most importantly, Ming Ming absolutely loves her new bed choosing to relax in this over sitting on the sofa with us on many occasions and seeing as this used to be her favourite thing to do the Donut bed must provide excellent comfort and added snuggle factor for her to choose this over us. Big paws up!! Thanks to Doggie Moggie Doodah for sharing their luxury donut bed with us for review.